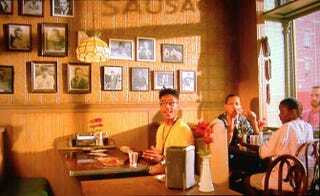 Buggin’ Out questions Sal about the “wall of fame” in Sal’s Pizzaria during a scene in Spike Lee’s Do the Right Thing. This summer marks the 25th anniversary of Do the Right Thing. June is also when part of Bedford-Stuyvesant's Stuyvesant Avenue—where the fim was shot—was renamed Do the Right Thing Way in honor of the film and its director, Brooklyn, N.Y.'s native son and outspoken gentrification critic Spike Lee. The Root's multimedia editor, Nicole Cvetnic, went to Bed-Stuy to photograph the locations that provided the backdrop for DTRT's iconic moments. Compare scenes from the movie—whose yellowed tone comes from the filter Lee used to depict heat—with their current, 2014 landscapes. The images seen here also use photo-editing technology to merge the then and now, providing visual reminders that while so much has changed since that fictitious hot summer day, plenty has stayed the same.